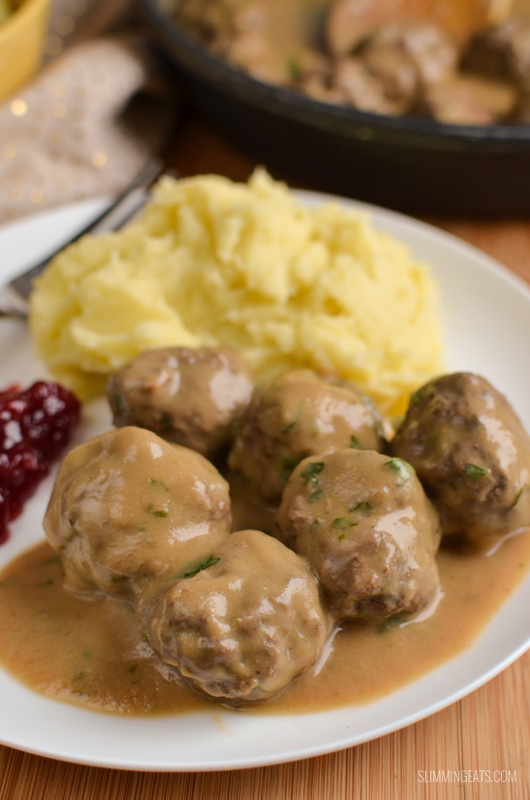 Chances are if you have ever been to Ikea, then you have tried their Swedish Meatballs and Gravy with lingonberry sauce. Well now you can make them at home and much lower in syns, plus this version tastes amazing. 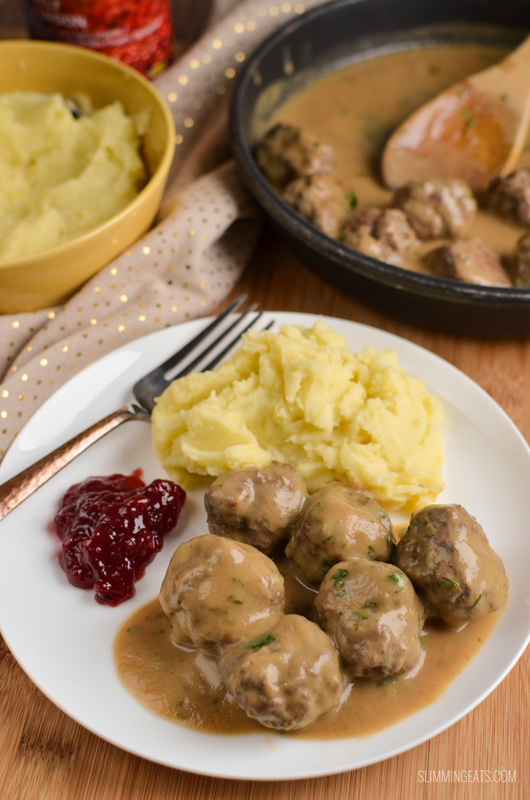 I might be a little biased, but seriously, these Swedish Meatballs and Gravy taste amazing, especially with a small dollop of said lingonberry sauce and my creamy Syn Free Mashed Potatoes – heaven!! If you can’t get lingonberry sauce then cranberry sauce will work just fine or if you are going near an ikea store, pick up a jar of their lingonberry sauce, it is only 1.5 syns for a tablespoon. 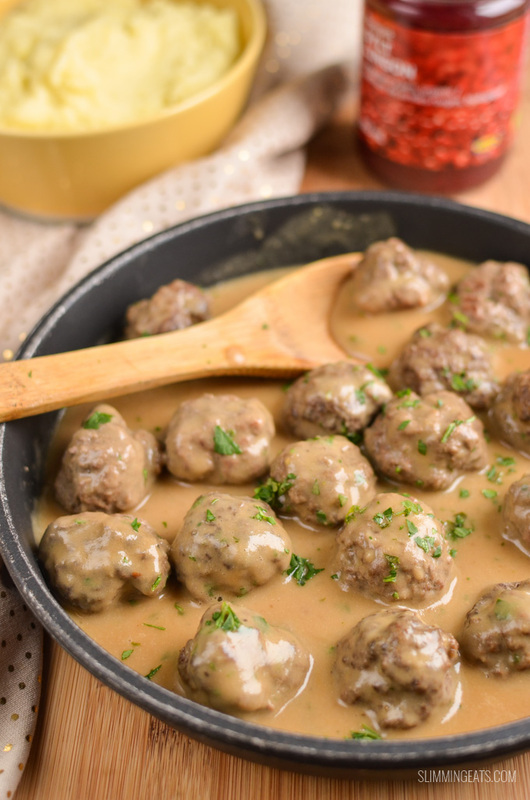 The gravy kind of follows on the same ingredients as my ever so popular syn free gravy with a couple of additions to turn it into that delicious creamy gravy that is traditionally served with the swedish meatballs. I blend the onions for the gravy using my awesome new Ninja Duo Blender with Auto IQ technology that you can see below. It is a super clever blender that features intelligent programs that combine pulsing and blending patterns, meaning no having to guess how long to pulse or blend etc. It’s amazing. For the meatballs it’s very limited ingredients, all you need is the ground beef and some seasoning and you are good to go, no complicated fancy ingredients. This recipe is gluten free, it isn’t however dairy free, although you an option to make this dairy free, is to use a little bit of coconut milk and add a little starch to thicken (corn, arrowroot or tapioca). Add the onion and fry until softened. Add the balsamic vinegar and continue to fry for approx 5 mins till the onions are a nice caramelized colour. While the gravy is simmering - add the ground beef to a bowl along with the salt and onion powder. Once gravy has simmered, add to a blender and blend till smooth. Add in the cream cheese and stir till melted. Add in the meatballs and simmer for 10 mins till meatballs are cooked through and sauce has reduced and thickened. Sprinkle with fresh chopped Italian parsley and season to taste with salt and black pepper. If you prefer you can use quark to keep this syn free. I prefer the creamy taste from the cream cheese, quark tends to be more sour. This recipe was absolutely delicious! 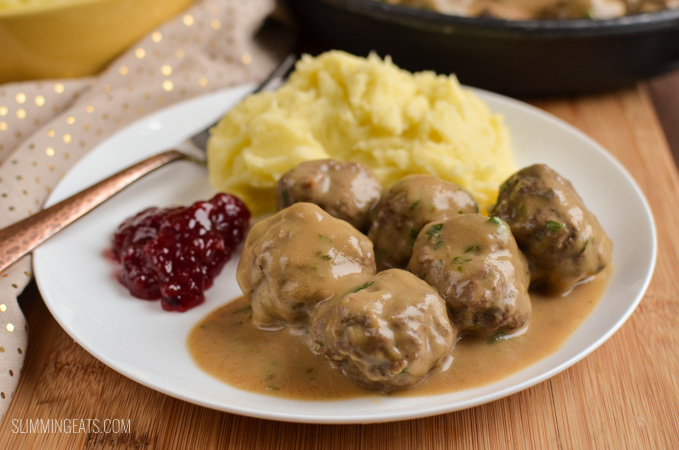 I always feel like I’m missing out when visiting IKEA and on returning home when my other half has bought the meatballs and sauce but this recipe certainly satisfies that craving! Truly yummy! Another massive hit by Slimming eats! This one is a must make! Comfort food at its best and id say tastes better than the real thing! Fabulous!! Hey looks lovely. 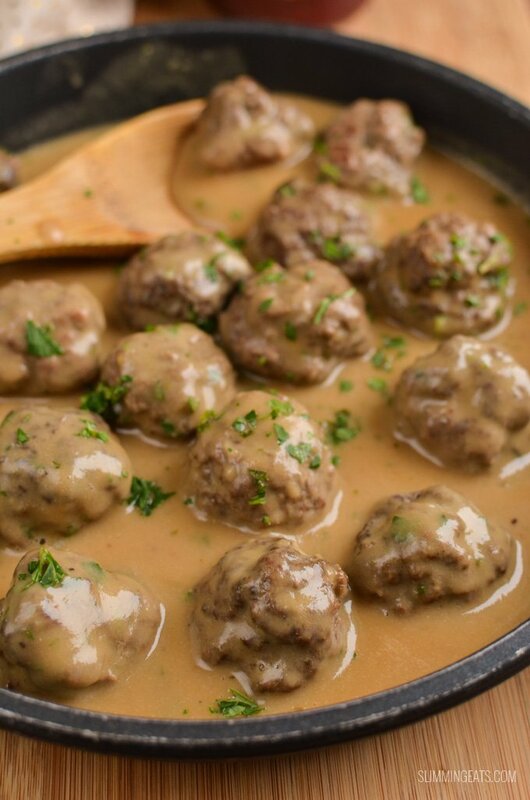 Was womderimg could I make up the sauce to blend it now and then an hour later put in the pan and add meatballs and cream cheese? it may work if you add it right at the end so it doesn’t split, it won’t give quite the same creaminess. 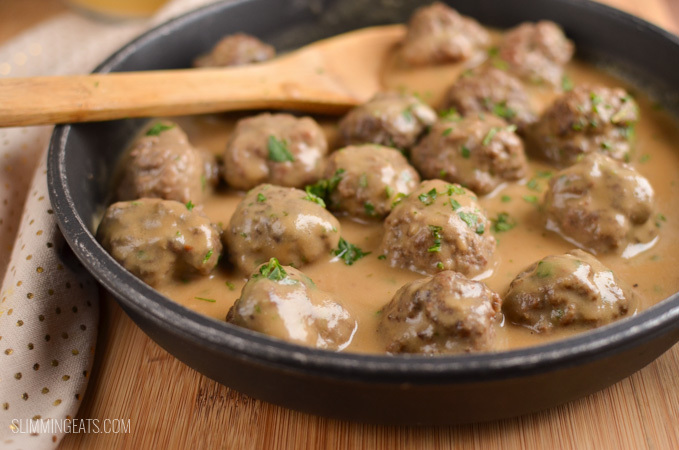 I’m going to freeze these meatballs – would you recommend doing it before or after they are cooked? You can do either. I personally would freeze with the gravy. Love this recipe ! So easy and tasty ! The whole family love this ! Fab with creamy mash !